This stationary sofa is traditional in style, perfect for your living room or family room. 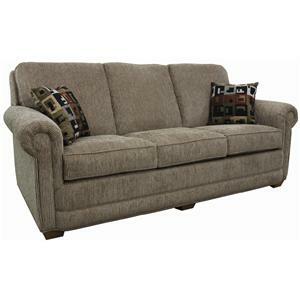 At 80 inches wide, this sofa features plump box seat cushions with matching welt cord trim and plump back cushions. 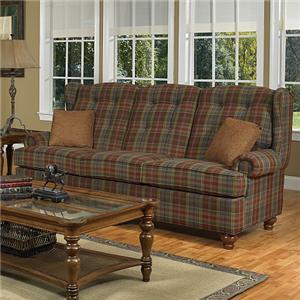 A skirted base and padded rolled arms complete the classic style of this sofa. With multiple fabric options available, create a custom look that fits your style and decor. This stationary sofa is available in 72 inch and 80 inch sofa options. The 650 Traditional Regular Length Sofa with Rolled Arms by Lancer at Town and Country Furniture in the Hamburg, Buffalo, Lackawanna, Eden, NY area. Product availability may vary. Contact us for the most current availability on this product. Create a comfortable and classic room design with the 650 series. 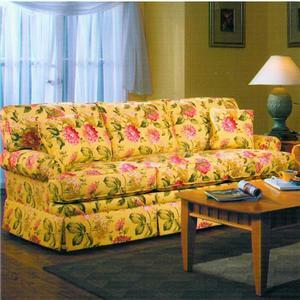 Padded rolled arms, skirted bases and plump seat cushions create a cozy place to relax with your friends and family. 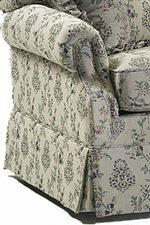 With large choice of fabrics to choose from, you can create a custom look for your living room or family room. A matching loveseat and chair are also available. The 650 collection is a great option if you are looking for Traditional furniture in the Hamburg, Buffalo, Lackawanna, Eden, NY area. Browse other items in the 650 collection from Town and Country Furniture in the Hamburg, Buffalo, Lackawanna, Eden, NY area.